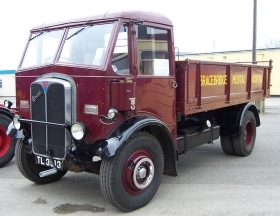 Fitted with an 80 bhp 4-cylinder petrol engine, this 'tipper' was used up until the early 1950's carrying coal and coke to the Bracebridge Mental Hospital at Bracebridge Heath, replacing a steam wagon on these duties. One interesting point is that on the inside of the front chassis there is a brass plate declaring that "This vehicle is the property of AEC Ltd", suggesting that it was leased rather than purchased from AEC. It was sold in 1955 to a contractor and tree-feller after being stored for five years and was then subsequently consigned to a scrap yard with engine failure. Rescued by the Society in 1968, with the help of one of the Society's trustees, it was restored in the early seventies to working order again, the restoration completed in 1975. The vehicle was off the road for much of the 1990s due to a poor cylinder head. A new head was acquired in 2002, and a replacement top radiator tank acquired. Thanks to Nick Taylor from Oxford and David Hawkins from South Wales for their valued help here. After some work, the Monarch returned to the road in 2002. July 2012 - Dave H checked over the truck so it could run to the AEC Rally at Newark with several other Museum vehicles at the end of May. It ran really well once warmed up, guzzling a fair bit of petrol in the process! Nice to see it out and about once again after several years' inactivity!